Many languages and algebras have been proposed in recent years for the specification of authorization policies. For some proposals, such as XACML, the main motivation is to address real-world requirements, typically by providing a complex policy language with somewhat informal evaluation methods; others try to provide a greater degree of formality – particularly with respect to policy evaluation – but support far fewer features. In short, there are very few proposals that combine a rich set of language features with a well-defined semantics, and even fewer that do this for authorization policies for attribute-based access control in open environments. 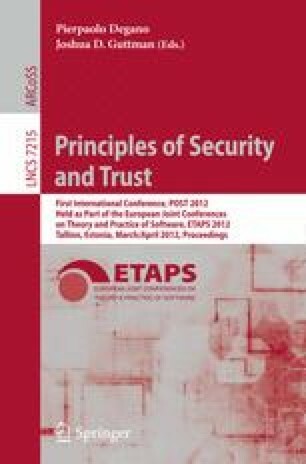 In this paper, we decompose the problem of policy specification into two distinct sub-languages: the policy target language (PTL) for target specification, which determines when a policy should be evaluated; and the policy composition language (PCL) for building more complex policies from existing ones. We define syntax and semantics for two such languages and demonstrate that they can be both simple and expressive. PTaCL, the language obtained by combining the features of these two sub-languages, supports the specification of a wide range of policies. However, the power of PTaCL means that it is possible to define policies that could produce unexpected results. We provide an analysis of how PTL should be restricted and how policies written in PCL should be evaluated to minimize the likelihood of undesirable results. 1.Information Security GroupRoyal Holloway, University of LondonEgham, SurreyU.K.